comPADRE is a great resource for Physics and Astronomy teachers and students. 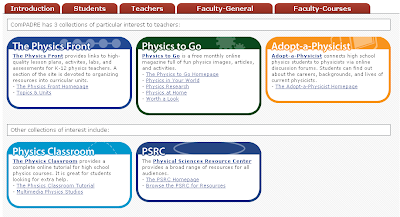 It is a network and collection of free online resources for students and teachers. The collections are organized by Students, Teachers, and Faculty (higher ed). Resources include tutorial sites, games, research, career information, online magazine, teacher lesson resources, and much more. Here are three collections for teachers, along with two other recommended ones. There are also community resources where you can connect, collaborate, and share resources and tips with others. 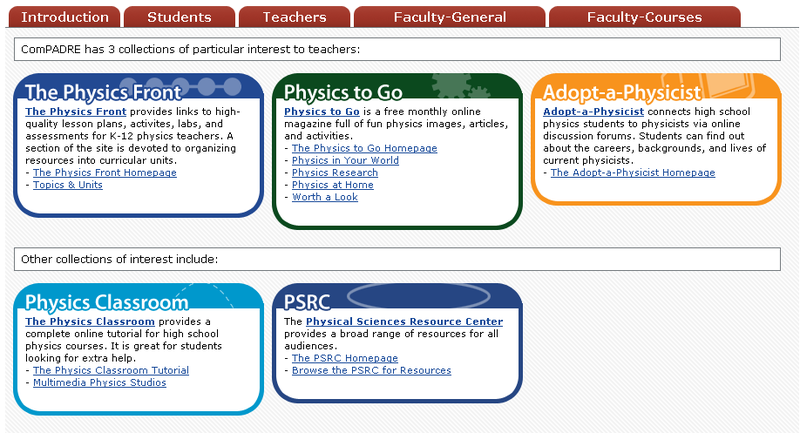 One of the resources they have in their collection is one of my favorite for Physics Students - the Physics Classroom. There are many other great resources here too. If you teach, or take, Physics or Astronomy, or know someone who does, this is a great resource to use and share.